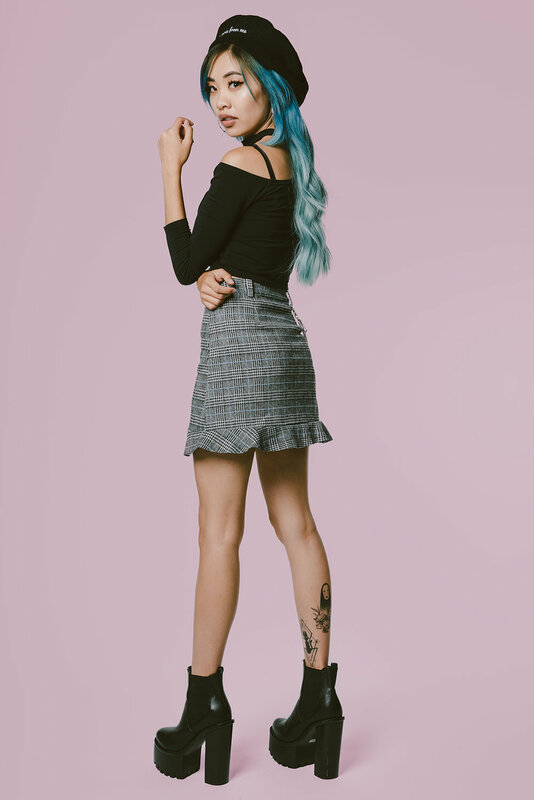 The Wicked Lady or Michelle Dee, as her friends know her, is a content creator/ blogger/ and fashion icon known for her sweet, bubbly, and fun personality. She may seem quiet and shy at first, but give her time and you will see the outgoing girl she came to be. A Vietnamese- American girl based in Los Angeles that gets her fashion inspiration from the ever-changing seasons and her differing moods. She is definitely not afraid to express herself; from rocking trendy modern- chic and colorful pastel looks to grunge-edgy fashion. Even though she can rock different looks, she always keeps it classy. But the more unique it is, the better. Everyday is a new day, so her style is always different. Michelle is a creative person that knows how to balance work and life without any problems. Knowing when to have fun and when it is time to work is very important and she does it flawlessly. She believes anyone can be influential and that beauty is also skin deep. You may have seen her in the Fine Brothers Entertainment Youtube channel’s entertainment and react videos. Her blog, The Wicked Lady, is always up-to-date with her new looks. You can always check out fresh content from https://thewickedlady.weebly.com/ as well as her Instagram, @thewickedlady, to get updated daily stories. Hello, My name is Michelle Dee, and I’m a Vietnamese-American twenty one year old I would like to consider myself a very simple fashion blogger. I like to create outfits that are not only affordable, but comfortable and easily achievable. I’m not materialistic, I don’t own a single name brand item, because I grew up not caring for anything expensive. I’m a fourth year college student, achieving my bachelors in Psychology. Growing up in LA all my life, I’m exposed to a lot of different and unique styles from people I’ve met overtime. I strongly stand for freedom of expression, and being confident in whatever you want to wear. I think it’s fun being able to switch up styles and be creative with your clothes, instead of sticking to one preferred “style”. One day I can be chic and modern, other days I can pull off grunge or even girlish looks. My clothing preferences normally chances daily with my mood or even with the seasons. In a sense, clothes and beauty is your secret identity. It is a form of art, and everyone has their own views on what art is. What got me interested was the fact that I could be a completely different identity with what I wear or put on my face. I was always a fan of a lot of Instagram bloggers because of how aesthetically pleasing their look was on their feed. It was inspiring, especially because they have a distinct style that people automatically knew who they were by a quick look of them. Honestly, I don’t live that lavish lifestyle we see on social media. A lot of people post traveling, luxurious lifestyles that a lot of us viewers would LOVE to have, but we experience behind a screen. I typically sleep in whenever I can, and while I’m still in school, most of my time goes to studying, doing homework, and playing video games when I have the free time. On days when I am not in school, I’ll commute to LA for fashion photo shoots, and even a couple of meetings here and there with specific brands. There’s not much to my life! But I am very content and happy with my pace. I usually wash my face with the current cleansers that I use, and I switch up products whenever I run out to get my skin to try out new products. As of right now I currently use Kiehl’s Facial Cleanser and First Aid Beauty Ultra Rapid Repair Cream. I moisturize my face, and wait about an hour for my skin to absorb the nutrients from what I currently use. That’s it! No serums, no oils, no sprays, (Unless I’m feeling my skin needing extra love, then I will use a Rose Petal spray. After that, I take about 10-15 minutes to do my makeup, then I will curl and style my hair. I normally have an outfit picked out and ready the night before, mainly because it relieves me of my stress of figuring out what to wear that following day. I don’t, it usually just how I feel at the time. I’m a very indecisive person, so I used to change my hair color every other month. I try to follow colors from the color wheel, to prevent bleaching and more damage to my hair. I also try to correlate my hair color to seasons or holiday’s at the current time. So right now, because it’s October, I decided to go natural and go ash brown. 8. What are your favorite fashion brands? Currently I am loving the Eggie Shop, Dolls Kill, Boohoo, Forever 21, i also love Demonia and KillStar Co! 9. What are your go-to clothing items? I’m a basic person, so I normally would go for a comfortable oversized sweater, and I can pair it up with a headwear item like a beret. If I’m feeling a little fancy, I’ll add a belt, and wear either comfortable shoes or thigh high booties. Most of the time i lounge in sweats and a t. Nothing too boujee! Honestly, I don’t know yet! I’m usually just going with the flow, and blindly taking my own path. I would love to lure more towards makeup projects and more moody photo shoots with simplistic fashion. Along with fashion and beauty, i want to add more life style into it while still speaking out my mind on current events, not necessarily wanting to be an advocate, but i just want to be more aware of societies issues.